*The below will also be updated on an ongoing basis with continued research. 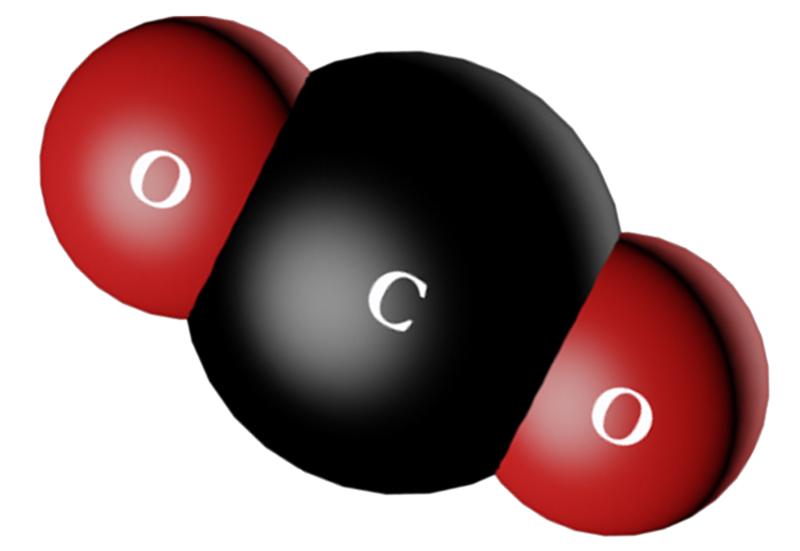 The chemical compound carbon dioxide (also known by its shorthand CO2) is the primary greenhouse gas and driver of climate change. It’s an integral part of life cycles on earth, produced through animal respiration (including human respiration) and absorbed by plants to fuel their growth, to name just two ways. Human activities are drastically altering the carbon cycle in many ways. Two of the most impactful are: one, by burning fossil fuels and adding more carbon dioxide into the atmosphere; and two, by affecting the ability of natural sinks (like forests) to remove carbon dioxide from the atmosphere. It’s all about timing when it comes to differentiating weather and climate. Weather refers to atmospheric conditions in the short term, including changes in temperature, humidity, precipitation, cloudiness, brightness, wind, and visibility. While the weather is always changing, especially over the short term, climate is the average of weather patterns over a longer period of time (usually 30 or more years). So the next time you hear someone question climate change by saying, “You know it’s freezing outside, right?”, you can gladly explain the difference between weather and climate. Many people use these two terms interchangeably, but we think it’s important to acknowledge their differences. Global warming is an increase in the Earth’s average surface temperature from human-made greenhouse gas emissions. On the other hand, climate change refers to the long-term changes in the Earth’s climate, or a region on Earth, and includes more than just the average surface temperature. For example, variations in the amount of snow, sea levels, and sea ice can all be consequences of climate change. Fossil fuels are sources of non-renewable energy, formed from the remains of living organisms that were buried millions of years ago. Burning fossil fuels like coal and oil to produce energy is where the majority of greenhouse gases originate. As the world has developed and demand for energy has grown, we’ve burned more fossil fuels, causing more greenhouse gases to be trapped in the atmosphere and air temperatures to rise. Sea-level rise as it relates to climate change is caused by two major factors. First, more water is released into the ocean as glaciers and land ice melts. Second, the ocean expands as ocean temperatures increase. Both of these consequences of climate change are accelerating sea-level rise around the world, putting millions of people who live in coastal communities at risk. Global average temperature is a long-term look at the Earth’s temperature, usually over the course of 30 years, on land and sea. Because weather patterns vary, causing temperatures to be higher or lower than average from time to time due to factors like ocean processes, cloud variability, volcanic activity, and other natural cycles, scientists take a longer-term view in order to consider all of the year-to-year changes. Renewable energy is energy that comes from naturally replenished resources, such as sunlight, wind, waves, and geothermal heat. By the end of 2014, renewables were estimated to make up almost 28% of the world’s power generating capacity, enough to supply almost 23% of global electricity. Because renewables don’t produce the greenhouse gases driving climate change, shifting away from fossil fuels to renewables to power our lives will put us on the path to a safe, sustainable planet for future generations. These two abbreviations are best described together as they work hand-in-hand. The United Nations Framework Convention on Climate Change (UNFCCC) is an environmental treaty that nations joined in 1992, with the goal of stabilizing greenhouse gas concentrations in the atmosphere at a level that would prevent dangerous human interference with the climate system. Meanwhile, the Conference of the Parties (COP) to the UNFCCC is a yearly international climate conference where nations assess progress and determine next steps for action through the UNFCCC treaty. This year marks the 21st Conference of the Parties (COP 21), which will be held in Paris beginning November 30. Here, a historic global agreement to reduce greenhouse gas emissions is on the table and, if passed, will mark a landmark achievement in the fight against climate change. 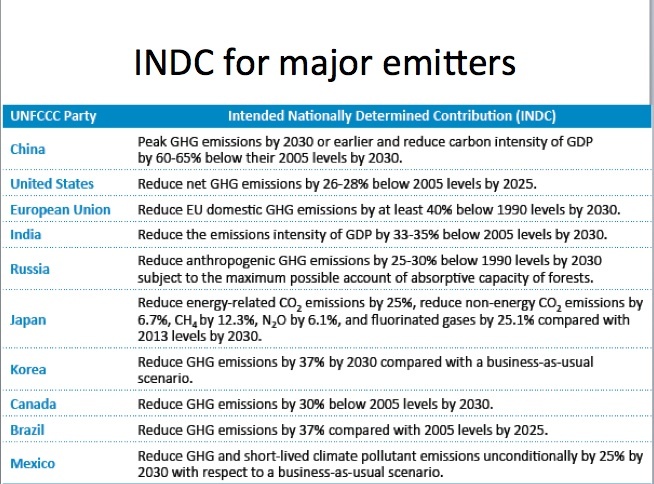 INDC stands for “Intended Nationally Determined Contribution.” In preparation for the UN climate talks later this year, countries have outlined what actions they intend to take beginning in 2020 under a proposed global climate agreement. These plans are known as INDCs, which will play a big part in moving us forward on the path toward a low-carbon, clean energy future. IPCC is the acronym for the Intergovernmental Panel on Climate Change. 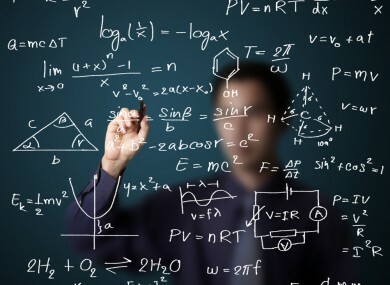 First set up in 1988 under two UN organizations, the IPCC surveys the research on climate change happening all around the world and reports to the public about the current state of our scientific knowledge. PPM stands for “parts per million,” which is a way of expressing the concentration of one component in the larger sample. Climate scientists and activists use the term to describe the concentration of pollutants, like carbon dioxide or methane, in the atmosphere. Many scientists agree that carbon dioxide levels should be at 350 PPM to be considered safe; we’re at about 400 PPM right now and this number is growing by approximately 2 PPM each year. 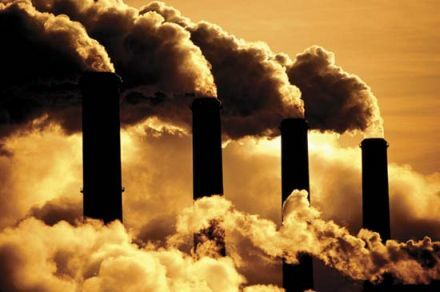 Pre-industrial levels of carbon dioxide refers to carbon dioxide concentration in the atmosphere prior to the start of the Industrial Revolution. Scientists estimate these pre-industrial levels were about 280 PPM, well below where we are today. Methane is a chemical compound that’s the main component of natural gas, a common fossil fuel source. Just like carbon dioxide, methane is a greenhouse gas that traps heat in the atmosphere. Methane accounts for about 10 percent of all US greenhouse gas emissions (using 2013 figures), second only to carbon dioxide. Many people don’t understand the negative effects of methane as an alternative to other fossil fuels. While methane doesn’t stay in the atmosphere as long as carbon dioxide, it absorbs 84 times more heat, making it very harmful to the climate. Mitigation refers to an action that will reduce or prevent greenhouse gas emissions, such as planting trees in order to absorb more CO2. It can also include developing and deploying new technologies, using renewable energies like wind and solar, or making older equipment more energy efficient. The equivalent of a vicious or virtuous circle – something that accelerates or decelerates a warming trend. A positive feedback accelerates a temperature rise, whereas a negative feedback decelerates it. 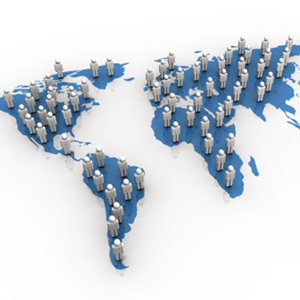 A population describes a group of individuals of the same species occupying a specific area at a specific time. Some characteristics of populations that are of interest to biologists include the population density, the birthrate, and the death rate. If there is immigration into the population, or emigration out of it, then the immigration rate and emigration rate are also of interest. Together, these population parameters, or characteristics, describe how the population density changes over time. The ways in which population densities fluctuate—increasing, decreasing, or both over time—is the subject of population dynamics. The first and most basic model of population dynamics assumes that an environment has unlimited resources and can support an unlimited number of individuals. Although this assumption is clearly unrealistic in many circumstances, there are situations in which resources are in fact plentiful enough so that this model is applicable. What happens to population size over time under exponential growth? If r (intrinsic rate of increase) is negative, the population declines quickly to extinction. However, if r is positive, the population increases in size, slowly at first and then ever more quickly. In logistic growth, the rate of growth of a population depends on the population's density. When the population size is small, the rate of growth is high. As population density increases, however, the rate of growth slows. Finally, when the population density reaches a certain point, the population stops growing and starts to decrease in size. Logistic growth is also described as "density-dependent growth".